The Society of Protozoologists began its publication of The Journal in 1954 with the first issue dedicated to the memory of L. L. Woodruff. It has been published uninterrupted since then, promoting the study of protozoa in particular, and protists in general. Six issues per year are now published on original research on protists, including lower algae and fungi, and covering all aspects of the biology of such organisms. Original research articles deal with behavior, biochemistry, cell biology, chemotherapy, development, ecology, evolution, genetics, molecular biology, morphogenesis, parasitology, physiology, systematics, and ultrastructure. 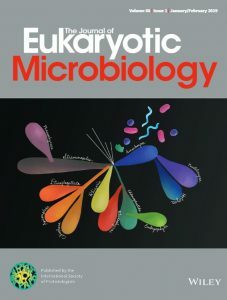 The Journal of Eukaryotic Microbiology changed publishers as of January 1, 2005, and is published by Wiley. The archives are also available to BioOne subscribers through Allen Press. If you or your institution are BioOne subscribers, you will be able to browse the archives. Please contact Michael Dolan, for information and purchasing information. Protocols in Protozoology are now available in digital format. We’re very pleased to be able to bring this valuable resource online. The Society of Protozoologists Archives now reside among the Special Collections in the AO Kuhn Library at the University of Maryland Baltimore County (UMBC). In the Fall of 2001, the ‘Finding Aid’ to the Archives collection was put on the Web for all to make use of. On behalf of the Society, thanks to the AO Kuhn Library’s archival specialist, Marcia Peri, for her efforts in helping the Society arrive at this important milestone in the maintenance and promulgation of its history. At the present time the collection of bound issues of the Society’s Journal encompass only Volumes 1 thru 41 (1954-1994). With a gift from Past-President Bleyman we plan to fill in the missing backfile volumes up through Volume 48, 2001. For further information contact Richard A. Synder, ISOP Archivist.